At the beginning of 2017 I wrote about my focus for the year. I’ve posted a few updates throughout the year (quarter year, half year & three quarters) and now is the time to do a final review. After learning in the past that having multiple goals dilutes focus and causes competition for a limited amount of time, I decided starting last year to focus my goals (challenge, habit & exemplar) around a single topic. For 2017, the theme was centered around the idea of a sabbath year – a year of rest. I found that centering around that topic worked really well. My efforts towards each of the three goals contributed in part towards each other and they feel very much as three notes of the same chord rather than three diverging items. I think there is still room to improve how much of my free energy – that which excludes family care, self care & earning an income – goes towards my yearly focus. I definitely invested in a few other topic this year and think I can do better at focusing more. We launched the year on July 13th which means we just about completed the first half of it by the end of the calendar year. Reflecting on the year, the heavy lifting for this challenge during the first six months of this year was centered around defining expectations and preparation logistics. While it had seemed like the sabbath itself would be easy, in fact it has presented itself with its own difficulties. What I have learned is how important familiarity is when it comes to the difficulty of something. For a competitive marathon runner, running something like a double-marathon is not the most challenging thing – running casually with no races in mind for a whole year might be. The former follows a known type of difficulty, while the latter is completely foreign. This year has forced me to rethink a lot about my identity, priorities and the purpose of challenging myself. Though that is not what I thought I was signing up for, I suppose it is not far from what I was after. I am still only half way through the sabbath year, which didn’t align with the calendar year, so there will be more to come from this in 2018. My habit for the year was to spend time outdoors with family, I was aiming for at least 7 hours per week. Over the course of the year 42 of the 52 weeks were successful. Of note, six of the ten missed weeks were in the first ten weeks of the year – meaning I got much better as the year went on. I actually averaged 10.25 hours outside per week which is about 50% more than 7 hours. The peak week was 24.5 hours. This habit also fit nicely with the theme of resting. Getting outdoors was a good way to get away from distractions and inputs as well as to make room for processing the thoughts spinning around in my head. Along with the success of the focus, or perhaps contributing to the success, this has been the best designed goal I have ever attempted. Most years, goals that are habit-like tend to be the ones I do the worst at. No matter what, I am usually cramming in December in order to have the least-bad result when the year closes. This year however, things feel much more organic. As a result of pushing through difficulties on a continual basis this year, I have gotten past hurdles so that certain activities are now much easier. Because of that, I think this habit will carry forward to future years with more success. Which is, of course, the real reason I do this. 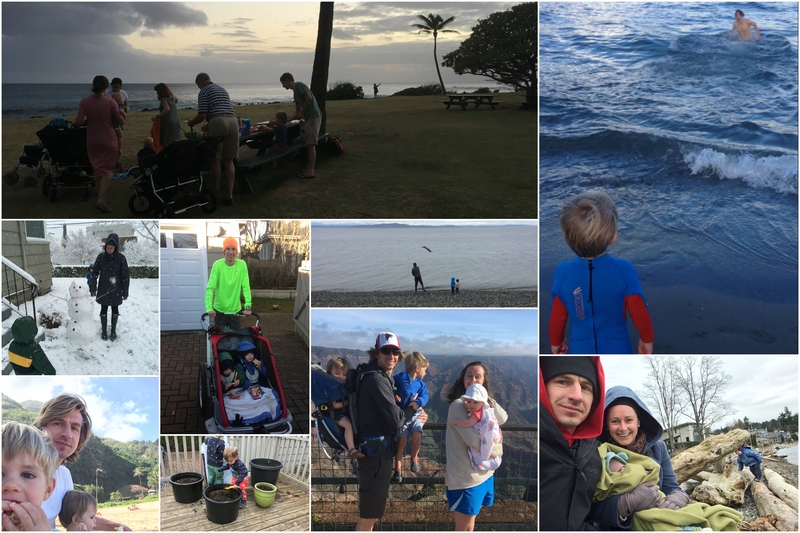 Here are the collages I made each quarter showing off a few of my favorite outdoor activities. In my second year having an exemplar, I made progress towards setting a standard for what I want this to look like, but still feel I have a long way to go. Over the course of this year I watched Chariots of Fire, a movie about Liddell, read For the Glory, a biography of him, read The Disciplines of the Christian Life, a devotional book he wrote, visited the site where he earned his Olympic Gold Medal in Paris and attempted to emulate his approach to races. Interestingly, aside from mentioning the fact that he didn’t run an Olympic heat on the sabbath, there wasn’t much information in the material I covered about his philosophy or approach to the sabbath. I was able to learn a good bit about other aspects of him: his disciplined prayer life, his commitment to doing what he believed God was calling him to and his ceaseless desire to serve others. The first of those is the most relevant to this year. It is what I consider a daily sabbath – time set apart from each day to spend in prayer, reading the bible and doing devotionals. One story of his commitment to this comes from when he was in an internment camp. Despite being underfed and overworked, he would rise each morning to pray, read by the light of home made candles and quietly sing hymns with other prisoners. The direness of those circumstances and his resolve throughout them reveals a lot about his character. This was not something he did on top of the many burdens he bore for others while at the camp, it is something he did so that he could continue to bear those burdens. His dedication to daily sabbath has served as a bit of a call out for me – what in my life is so difficult right now that I am not able to find that time as regularly as he was? – and also an encouragement – why should I think so highly of myself that I would be able to burden my load alone? With the start of a new year, I take the time to set my focus for the coming year. I believe that by focusing on fewer goals, I can achieve results that are exponentially greater than the sum of the results from doing many things. 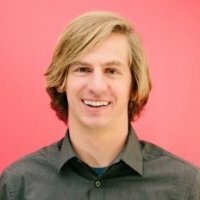 I detailed my 2017 focus here (read that first if you want more context) & did a quarter year update & half year update as well. Here is how I’m progressing since then. We launched the year on July 13th and are now three months in. It is really hard to have ‘sitting-in-a-hammock-reading’ type rest when you have three kids. My expectations were that I would have a lot more of that and in practice I have very little. Though I don’t feel very relaxed in a traditional sense of the word, I do already feel reenergized to get back to my career. I’m a pretty good dad, but I really feel in the zone when I’m doing my day job. I don’t quite have what it takes to be a full time parent – I think I do better when I have other things to do as well. This is one place in my life where I think splitting attention is a very good thing. The combination of nice weather and not having a job made being outside often very achievable. In fact, my peak week hit 24.5 hours. Meaning I spent greater than one full day of that week outside. 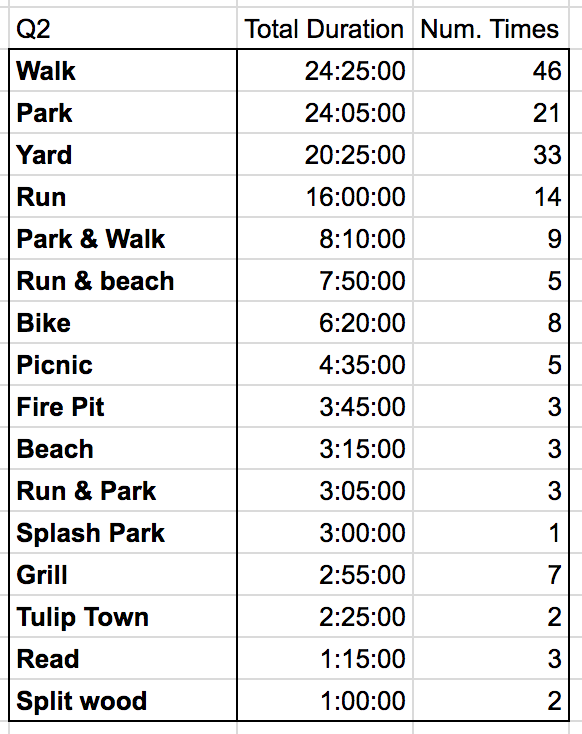 The average over the quarter was 16.5 hours, which is more than double the goal time of 7 hours. I only missed on one week and that was due to me being away from family for four days as I drove our van across the country. I might even have been able to hit the time in just 3 days if I hadn’t been so busy packing for said move. 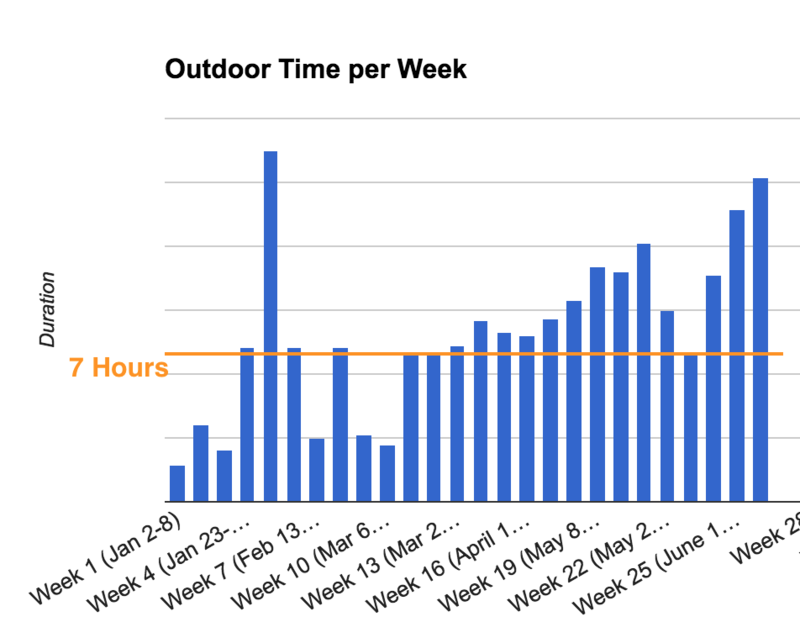 While a 16.5 hour per week average seems great, and felt like a lot of outside time, that is still slightly less than 10% of the time in a week. That means I spent 90% of my time indoors. This is during nice weather, where I didn’t have a job and was trying to be outside a lot. It makes me think that most people probably spend 98-100% of their time indoors. That seems suboptimal for our species. Here are some data about Q3. For activities, the leaders from the first half of the year remain popular – parks, walks, & hanging out in our yard. A lot more activities were on the list though this quarter. It included over 50 different activities. I could probably group some of them a bit more, but for now here is the top portion of the list. You know its a good list when it includes things like ‘woods’, ‘raft’ & ‘pick blackberries’. 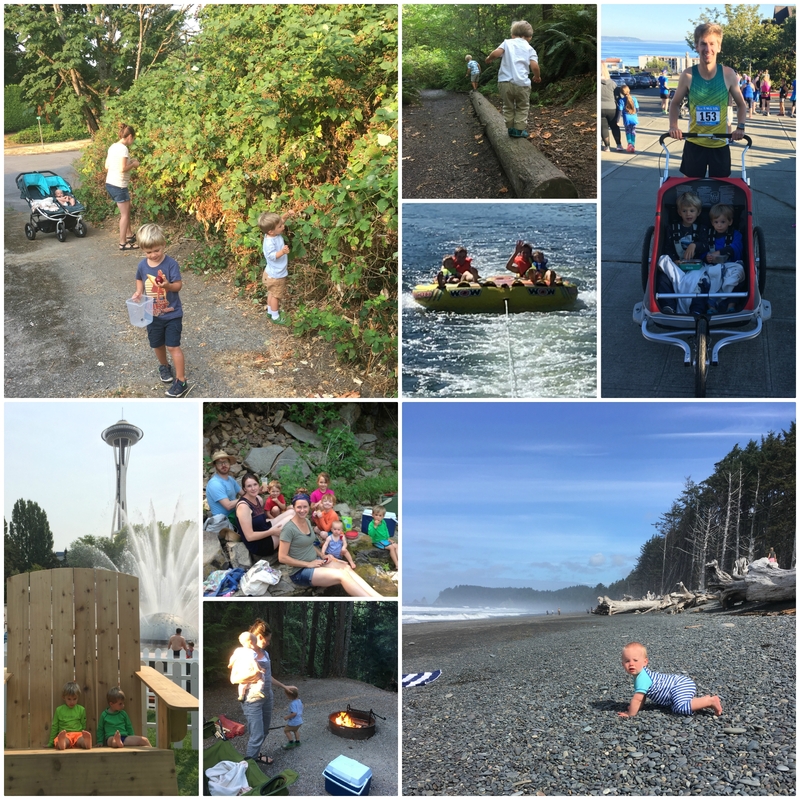 Looking at who within the family I spend outdoor time with – there were a few notable shifts. First, all five of us outside together went from being a close second grouping to the clear leader. Not having work meant we could spend a lot more time as a family. Second, I spent a lot more time taking care of all 3 kids solo. I hadn’t done much of that prior to this quarter, so it is cool to see how I grew into it. That was made much easier by my youngest’s learning to love being in the carrier backpack, which meant she could go along for walks in the woods & park. Third, I spend a lot more time 1×1 with my wife outside. Prior to this quarter we had spent a grand total of one hour outside alone together – sad. This quarter we spent 15 hours. That included a lot of sitting on the front porch or around the fire pit after the kids went to bed. After finishing a Liddell biography, I picked up a copy of the one book he wrote, a devotional about spiritual disciplines. Third quarter was fairly light on anything else in this area. I detailed my 2017 focus here (read that first if you want more context) & did a quarter year update as well. Here is how I’m progressing. My sabbath year will be launching on July 13th, 2017. After about five years of considering, exploring and planning, we are finally here. I recently wrote about our general sabbath year principles along with specific plans we have for this year’s iteration. With those completed and the launch forthcoming, it looks as if this challenge will be completed shortly. When I picked seven hours as the goal, it seemed achievable yet difficult. I did it based on a bit of data I had from previous years that I collected during an unrelated tracking experiment. During the first quarter I achieved about a 50% success rate, which suggested to me that the target was pretty good – possible but hard enough I had to work for it. The second quarter has been a different story. I’ve been successful 100% of weeks and my average is actually over 10 hours – with the progression showing a steady climb up to 15 hours during the last week of the quarter. What changed? It turns out, it is in fact a lot easier to be outside when it is warm, light and dry than when it is cold, dark and wet. In the second quarter, the daytime temperature hasn’t dropped below 50*. The days have stayed in the 50s and 60s – more recently climbing into the 70s and even the 80s a few times. So far, as it has gotten warmer, the amount of time I’ve spent outside has increased. It only got so warm that it was hard to be outside once, when it hit the 90s and even then we just stayed in the shade. I defend that 70* is the perfect temperature and 50-90* is the ideal range to be in 95% of the time. Along with the weather changing, the days have gotten longer. To give you an idea about how dramatic the difference in light is – look at this chart showing the type of light. 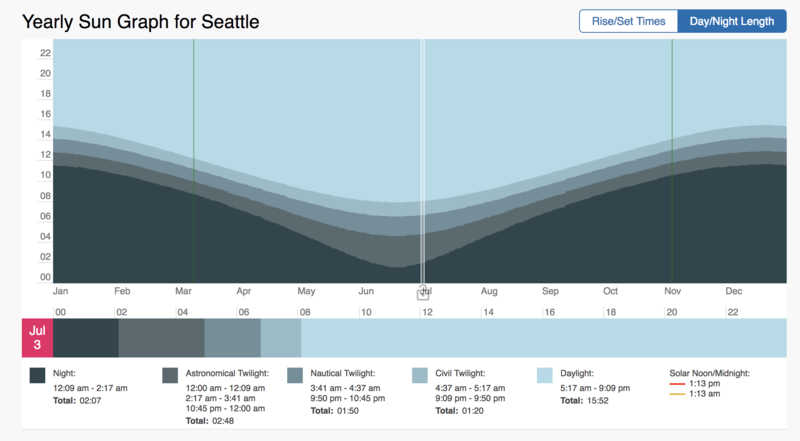 In the summer in Seattle there are only about 1-2 hours of real night level darkness where as in the winter it is above 10. That makes a huge difference in the number of activities it is possible to easily do outside after work. 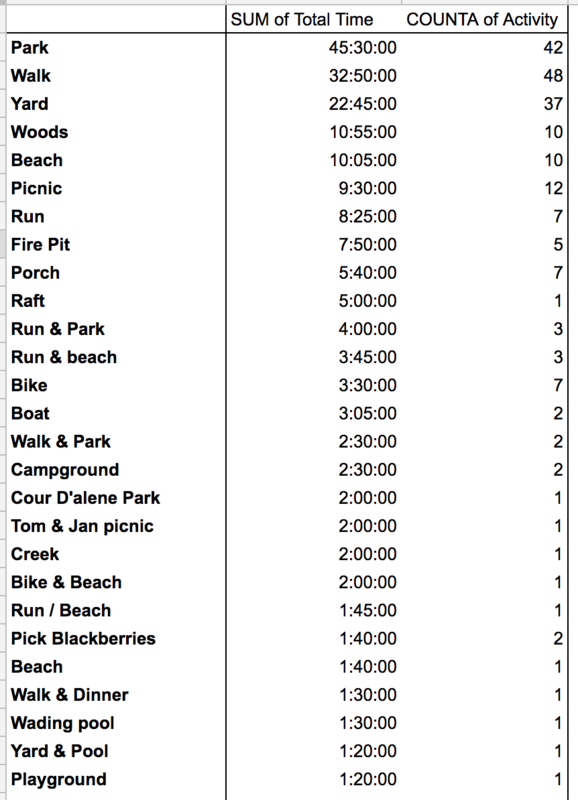 In fact, due to all of those changes, it is so easy to go outside that it is getting harder to tack our outdoor time. It used to be easy because there were such clear barriers between inside & outside time. We spent 10+ minutes getting ready to go outside between chasing down jackets, hats, gloves, etc. for 2-5 of us. Now we just wander in and out – not having to change layers at all – which makes accounting for time trickier. Here are some data about Q2. For activities, the leaders from Q1 remain popular – walks, the park & running. The new addition is hanging out in the yard which is our second most popular activity by frequency – thanks to a slide, trampoline and it being warm enough to get out the water play table. 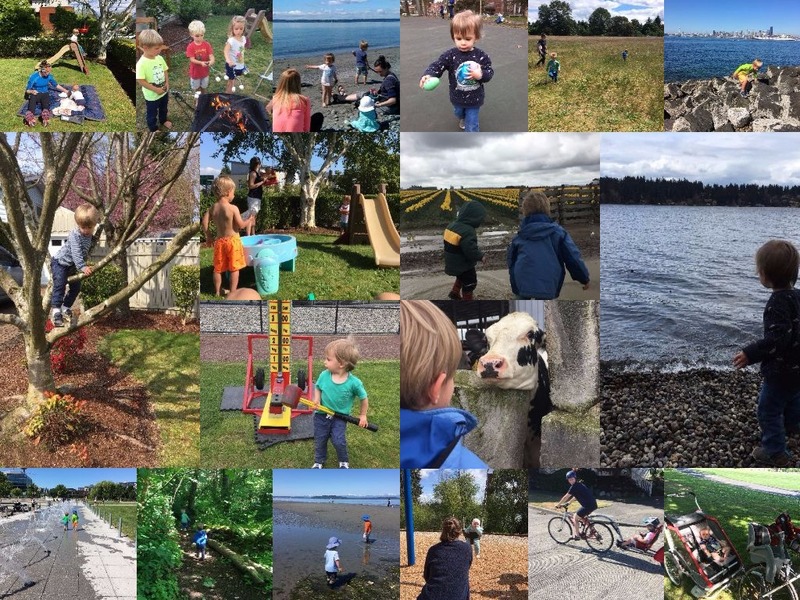 Looking at who I spend outdoor time with – the general trends are the same. I end up doing a lot with my two boys – the two older children. The second most popular is having my wife and daughter join us as well for a full family outing. 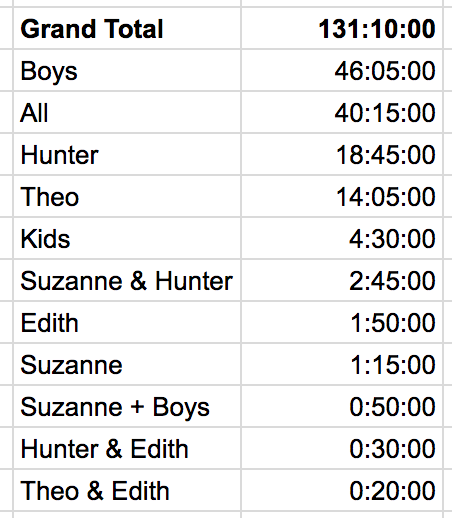 I did manage to clock time in almost every permutation of family during this quarter, which is cool. 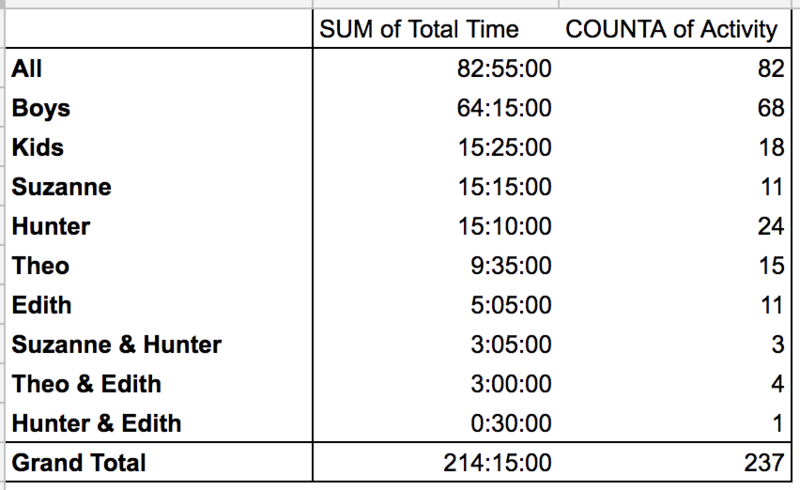 Hunter, my eldest, edged out Theo this quarter for a few reasons – his bedtime is later and it is still light during that time so we often run an errand on the bike or do something in the yard, like splitting wood. He has also only taking afternoon naps 50% of the time, which means there is often a mid day opportunity to do something. I do want to keep an eye on the balance though – an unintended learning from this data set. I am about to finish the biography about Liddell that came out recently – For the Glory. I want picking an exemplar to involve more than just reading a biography every year though so I have a few more things planned for the second half of the year. First I plan to read the one book he wrote – a devotional study. It’s creation is mentioned in the biography and one of his close friends and co-workers notes that his character is well reflected by the writing. That should be a good way to get to know more about what made him click. Finally, I happen to be going to Paris later this year, the place Liddell won his Gold Medal in the 400 meters during the 1924 Olympics. I’m going to see if I can get on the actual track and log a lap to compare splits. That seems like an apt way to walk a quarter mile in his shoes. I really wish going to China was an option to see the area around Xiaozhang (the rural area he worked in for a number of years) & Weihsien (the internment camp he eventually died in), but that likely isn’t possible in the near term.